Greek Marinated Chicken | Om nom nom! 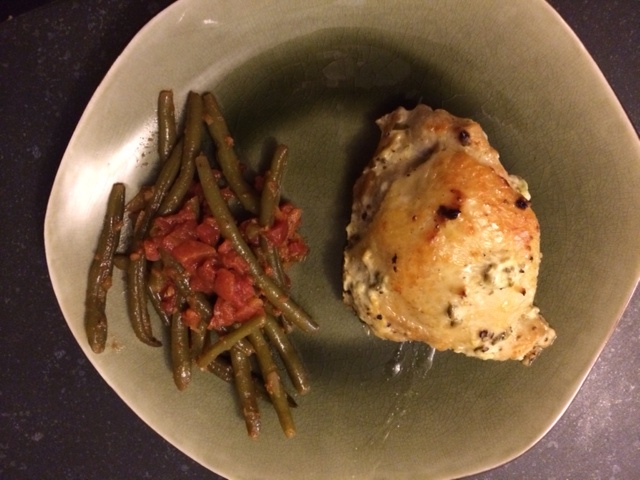 This was the first recipe I have tried from Budget Bytes, and we loved it! Simple and very tasty. We baked the chicken, but it would be excellent on the grill. The only change I made was to use Greek yogurt for plain yogurt, and I think it went well. We served this with Greek green beans, one of my favorite sides that unfortunately didn’t turn out (if you use diced tomatoes, watch they don’t contain chiles 😉 ). To make the marinade, combine the yogurt, olive oil, minced garlic, oregano, salt, pepper and lemon zest and juice from half the lemon.. Stir until the ingredients are well combined. Roughly chop the parsley and stir it into the marinade. Add the chicken pieces and marinade to a gallon sized zip top bag. Remove as much air as possible, close the bag tightly, and massage the bag to mix the contents and make sure the chicken is well coated. Refrigerate the bag for at least 30 minutes. After marinating either cook the chicken on a grill OR preheat the oven to 375 degrees in preparation to bake the chicken. If baking, place the chicken pieces in a large casserole dish and bake for 45-60 minutes, or until golden brown on top.